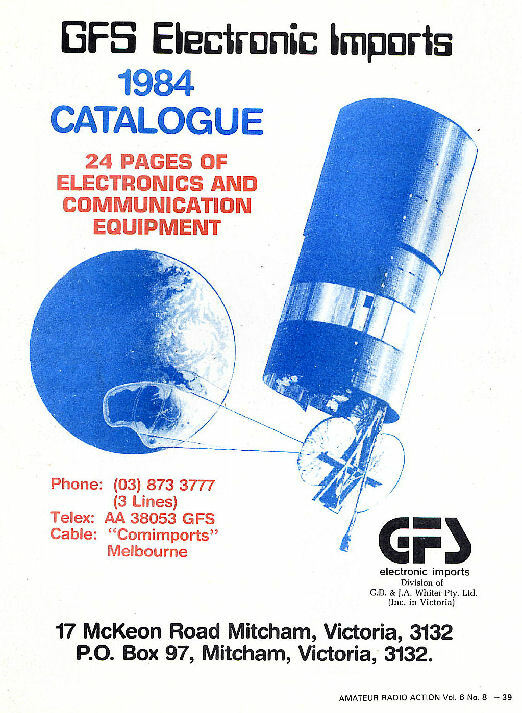 In 1984 GFS Electronic Imports released their second catalogue. The 1984 catalogue was much larger than that of 1982-83, having 24 colour pages. 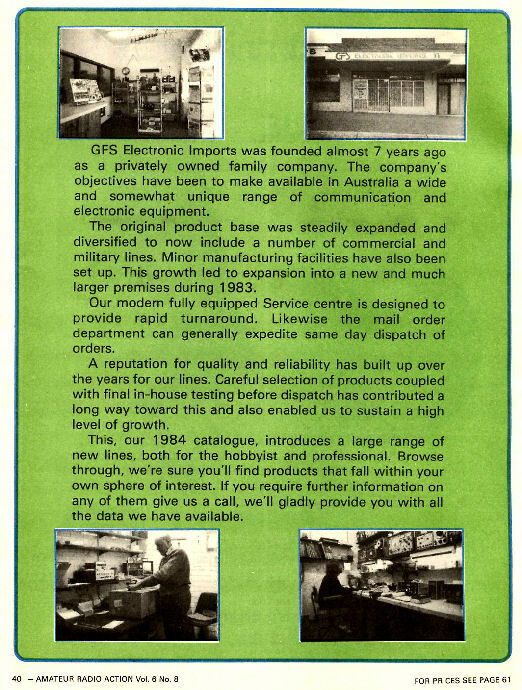 By 1984 the company had moved into new larger premises at 17 McKeon Road, Mitcham, Victoria, Australia and some photos of this new office were featured on the inside front cover of the 1984 catalogue. 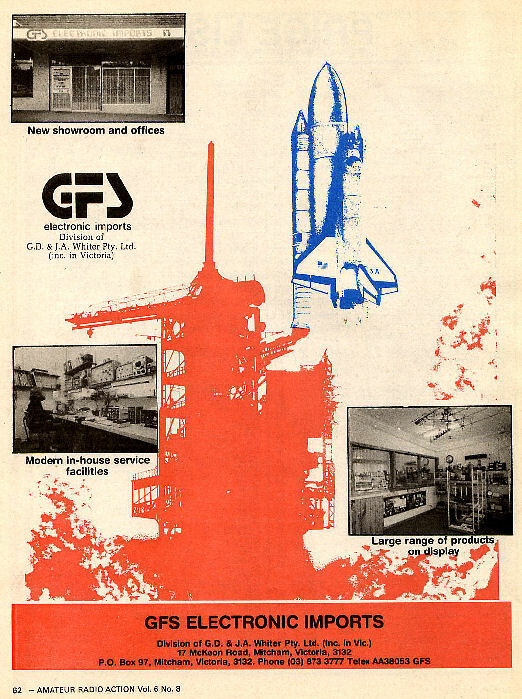 The outside back cover shown above also featured photos of GFS Electronic Imports then new 17 McKeon Road premises, including the display area as well as their service department with Jak Melia at the bench. 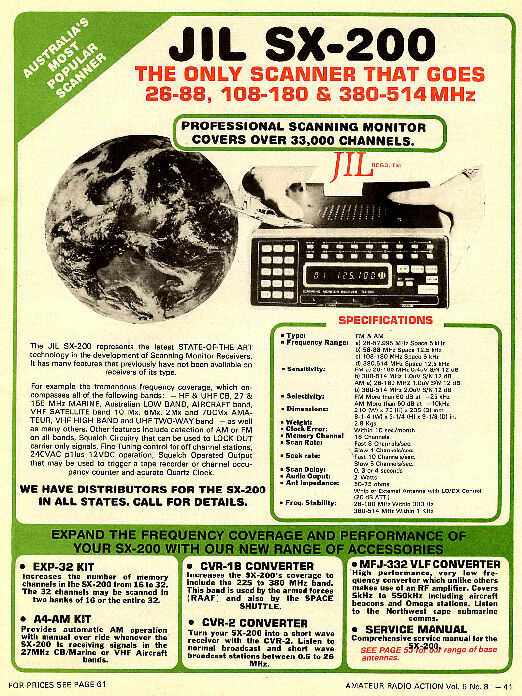 In 1984 scanning receivers still featured prominently in in the product range, as can be seen from the catalogue pages shown below. 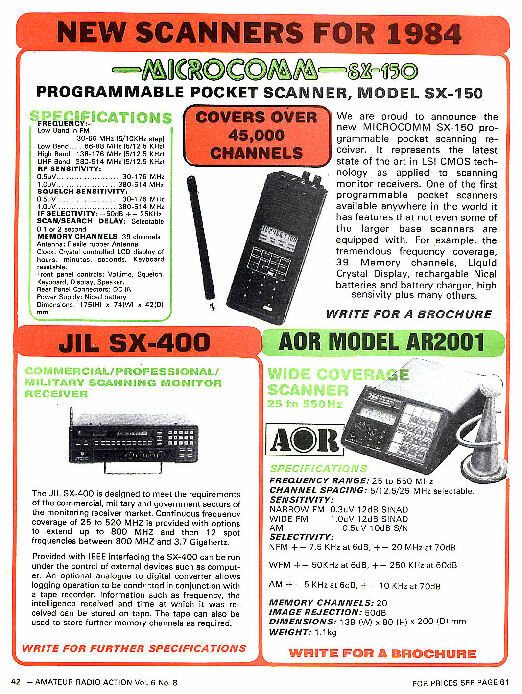 The JIL model SX-200 was still their largest selling scanner and was supported by a range of accessories, including a number of converters to extend it's frequency coverage as well as a memory expander and automatic AM kit. By 1984 GFS Electronic Imports had added a hand held programmable scanning receiver, the model SX150, to their product range. Also by this time JIL had announced a new higher performance scanner the SX-400. However the SX-400's performance fell well short of specifications and was never sold by GFS Electronic Imports. JIL subsequently went out of business. Although distributed in Australia by Emtronics in Sydney, the AOR model AR2001 scanner, shown above, was retailed by GFS in Melbourne. 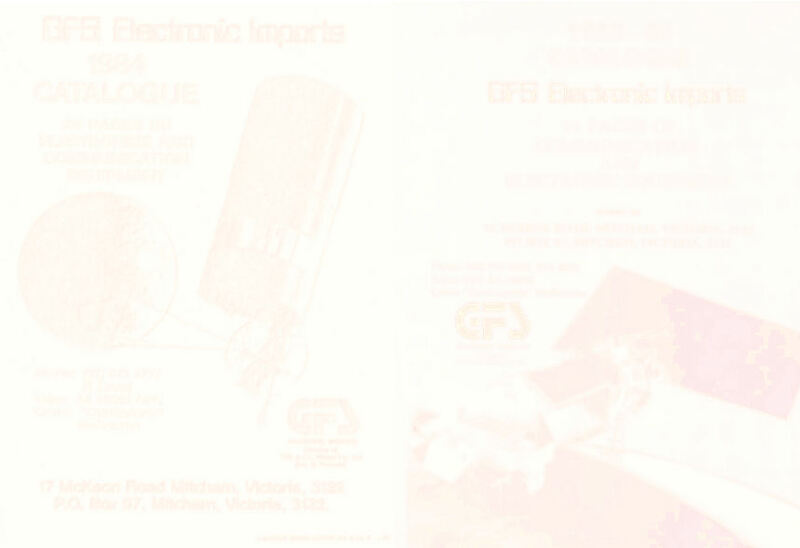 By 1984 GFS Electronic Imports' manufacturing activities had expanded a further with manufacture of a Radio Teletype Interface, the model MDK-17, and a complete radio data modem, the model CPU-100. 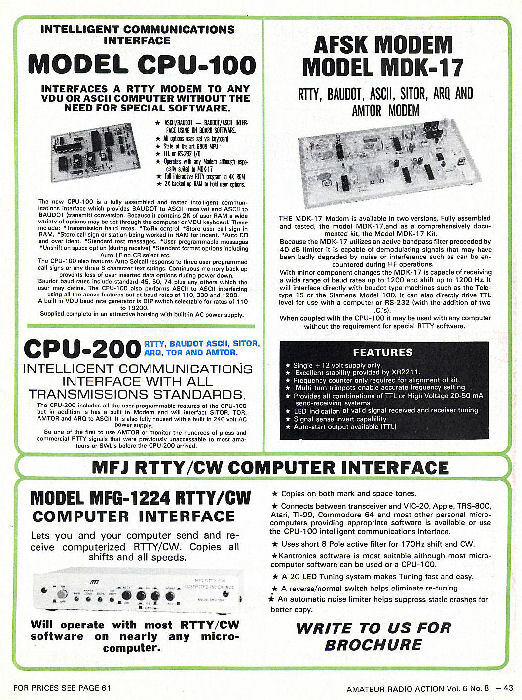 Details on the CPU-100 can be seen on the previous page of this article. MFJ Enterprises, a USA based manufacturer of communication accessories, had been represented in Australia by GFS since 1980. Apart from building a number of antenna tuners, MFJ also manufactured radio teletype interfaces such as the Model MFJ-1224 shown above. The Author, Greg Whiter, was employed by Bail Electronic Services (see 1974 Bail Electronics staff photo) from the late 1960's through to 1977. Following this period he formed GFS Electronic Imports, GFS Electronics and then in 2012 Portable Masts Australia Pty Ltd, of which he is a director today.